Eric Maddox was a new interrogator in 2003 on his first deployment since 9/11 when he conducted over 300 interrogations which led to the capture of Saddam Hussein. Upon completion of the mission and for his direct role in the special operation, Eric received the National Intelligence Medal of Achievement, the Defense Intelligence Agency (DIA) Director’s Award, the Legion of Merit, and the Bronze Star. After having conducted over 2700 interrogations, Eric has mastered two things: adapting to new situations and environments and gathering the most accurate information so that the best decisions can be made. Gail Davis: [00:00:46] Today at GDA podcast we have Eric Maddox. 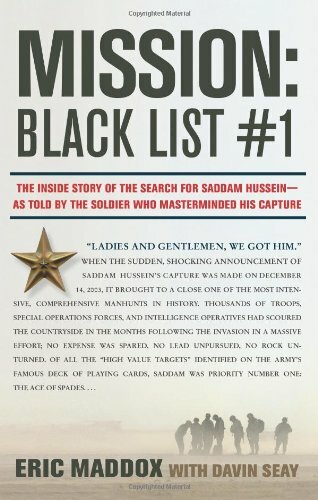 Not only is Eric a fellow OU Sooner, but he is also a army Ranger, turned interrogator who is largely responsible [00:01:00] for finding and capturing Saddam Hussein and he is also the author of a book called Mission Blacklist. There's so much to talk about but I just want to start by saying welcome Eric. Eric Maddox: Thank you Gail. Thanks Kyle. Thanks for having me. Kyle Davis: Well, happy to have you on. Gail Davis: So Kyle where should we start today? Kyle Davis: ... yeah the Declassified. Where they did a kind of a- an exposé, hour long exposé, on what you did in Iraq to capture Saddam Hussein but before we get to what that story is and everything else. If you can just kind of give the listeners just an idea of who you [00:02:00] are and what happened before you went to go work for Uncle Sam. Eric Maddox: Sure, no problem. So I'm Eric Maddox. I grew up in Oklahoma, went to University Oklahoma and right in the middle of my senior year I decided I wanted to enlist in the army and become an [aim entry men 00:02:18] so I did. I waited actually til the week after I graduated and then spent the next three years as an infantry paratrooper at the 82nd Airborne Division and I did, I went to [00:02:30] Ranger school, got my Ranger tab, was a jump master and squad leader. And then after that I found out about the foreign language program that the military had I thought was great and cool. So I took the test and I qualified for any language and I picked Chinese Mandarin 'cause I thought, you know that'd be difficult and I think the army's this amazing organization that can teach you things that I don't think I can actually learn. You know? Challenges that I don't think I can achieve. So I did that. And they said, "You [00:03:00] can't just be a linguist, you got to have a job." So I enlisted to be- reenlisted to be a Chinese Mandarin linguist/interrogator and was never, was told I would never do an interrogation, you know, I'll just be the Chinese Mandarin linguist. So I did that in the late 90s and was going right along as a Chinese Mandarin specialist and then 9/11 happened. And that changed everything. So we start going to these wars and then 2003 we went to [00:03:30] war in Iraq. And I guess they needed interrogators. And they started pulling them from other languages other than Arabic, which would be the standard way they would pull their linguists who are also trained interrogators. And I got pulled. And they said, "Really, they're pulling you because of your infantry background." And that's all I knew, was that I was gonna go do something in Iraq with some special group they couldn't tell me about and it [00:04:00] had something to do with the fact that I was a Ranger, had a Ranger tag, right? Eric Maddox: And that's all I knew going to war in 2003. Kyle Davis: Well that sounds like a fun way to start your first, I don't know, week into going in country, you're like "I don't know who I'm even going to be hanging out with." And then you show up and it's like okay, what do I do? And who did they sync you up with? Who did they link you up with and what do you do? Eric Maddox: So Kyle, it was exactly that. It was amazing, right? So, you [00:04:30] don't know anything. You leave the United States, you're going to Baghdad and the last thing I saw on the news was that the news was saying they think they killed Saddam Hussein's two sons. Udai and Qusai, right? Eric Maddox: And they were on that deck of cards, and they were a couple of the aces. That was big, well I get on the plane and I'm like, "Well I wonder if that's true?" And I get to Baghdad International Airport and I'm picked up by this JSOC, Joint Special Operations Command Task Force, and they're like, "Hey we're responsible for tracking down [00:05:00] everybody on that deck of cards." And I'd be like, "No Kidding." And they're like, "Yeah as a matter of fact, here's the two guys we got yesterday." And we went into a small room, and they were the bodies of Udai and Qusai. Right there, was the first two hours I'm on the ground in Iraq and I'm like, "Oh my goodness. What have I got myself into?" And that was my first day. Kyle Davis: Day one. Here's some bodies. Kyle Davis: So in case people are listening, I have some understanding of this, but in [00:05:30] this special operations world there's the US Special Operations Commander, SOCOM, and that's your Navy Seals, your Army Special Forces Green Berets, the Rangers, Air Force PJs, and so on and so forth. And then within that, you have like the all-star team, and I'm using air quotes. That's your Dev crew, aka Seal Team 6 guys and your Delta Force, or [00:06:00] whatever the real word is for them, like CAG, if you want to say that, Combat Applications Group. And so that's who they put you with, right? The cool guys with beards who don't have name tags? Eric Maddox: That's right. So I show up and you know kind of everybody in that task force's pretty cool. Like you said, kind of a cool group. But then you've got the super cool guys, and I was there couple of days and they said, "Listen, you're gonna go join this Delta Force team in Tikrit." And that was going to be the first time I was really gonna [00:06:30] run across the top echelon guys. And they sent me out there on a helicopter and, in the middle of the night, and first couple of hours with them was planing and executing a raid in the town of Tikrit. And it was nuts. It was crazy. Kyle Davis: So in case people are wondering, I kind of have an idea because we had this conversation before, but what was, I mean like you said, you hit the ground once you were in Tikrit, [00:07:00] now you're preparing for the next mission to go out and probably, you know, some high value target that you were going to go after, but what was the operational tempo that y'all were going after? And this is like how you're acclimating to you know, Iraq. Eric Maddox: So it's a great question Kyle. I mean for me, to understand even what operational tempo meant, I really didn't have a clear understanding. I'd been to war before, right? Eric Maddox: [00:07:30] So I didn't understand what these individuals were capable of. I mean really when you're in the Army, you always wonder if Delta Force even exists, right? Like is this real? And then, so you're with them, you're not exactly sure, you're just assuming they're going to be extremely good at their job. But even with when I joined the group, there wasn't [schedule 00:07:52], things had not been established in terms of, "Here's how we do things in Iraq, in this war." We'd only [00:08:00] been there a few months, the target set was changing, right? I mean gee, it was like, "Hey, we got to go after everybody on this deck of cards, but yet, is it the deck of cards that's actually leading this insurgency." And that's the guys killing our soldiers on a daily basis, and we can't find anybody on the deck of cards, but we got the enemy, you know, that we don't know either because they're blending in with the population. So we weren't exactly clear on what our actual mission was or [00:08:30] the pace that we should be going when I arrived. I didn't feel like it was established, but it was just a lot of determination that we were gonna go after, and we just called them bad guys. We're going after every bad guy that was out there. Whether on the deck of cards, or whether somebody who's setting off IEDs, right? Kyle Davis: And everything in between. Eric Maddox: Anything. I mean, really, anything. It was just, these guys were the best of the best, they were very [00:09:00] capable, tons of energy and they thought, you know, who else should do it? There's bad guys out there, let's go get them. And their big question was, who are the bad guys? Who are they? Because they're not wearing uniforms. They're not out in the jungles hiding. They're ... at night, they sleep with their families and at daytime they work jobs like everyone else. Yet some of them are [00:09:30] fighting this, setting off bombs, ambushes, those sort of things and we just didn't know who they were. Gail Davis: How long were you there, from when you first arrived, until you left? Eric Maddox: Five months. I got there in July. Eric Maddox: So again I think Udai and Qusai were killed on July 23, 2003 and Saddam Hussein was captured on December 13, 2003. December 13th was my last day in country. Kyle Davis: So, you're there, you show [00:10:00] up, you're in Tikrit, and then you're just going after the bad guys. So when did it, like you said, one day it's a deck of cards member or a friend or family member of somebody on the deck of cards, the next day maybe a bomb maker, or something else. At what point did you start to kind of get the sneaking suspicion that you might be onto something big? Eric Maddox: So I'm going to back you up a little bit Kyle. Eric Maddox: There was one step. First we had to do these, I had to do these interrogations and the really, [00:10:30] the first success that we had to find out was how to get these prisoners to talk. Because initially, the techniques that I was taught, they did not apply to insurgents in a small town in a middle east country. You know, they weren't soldiers, it wasn't on the battlefield, and the prisoners weren't opening up, and the techniques were completely ineffective. So myself, and one of the Delta Force team [00:11:00] members, he and I worked day in and day out trying to figure out, "How do we get these guys to open up?" What I realized is it really didn't have anything to do with them, it didn't matter what the evidence showed, I actually had to connect with them, right? I had to figure out what were their problems, what were their needs for them to open up and them to say, "Listen I didn't want to join the group but I had to because of the pressure due to the nature of [00:11:30] this neighborhood that I live in. Or this tribe that I'm a part of or some of my siblings got me involved. And you really had to understand, here's the problems they're going to have if they reveal, "Here's the insurgency groups that I'm a part of." Cause you could be going in after one of their cousins or brothers, or even their dad. So you had to understand those struggles and work around them. You had actually had to work with the prisoners. So the first thing, and that took United States a good month [00:12:00] to figure out how to open these prisoners up, to get actual intelligence, which then leads us to, "Okay we're hunting down bad guys." And it was probably three months, probably 200 interrogations into my tour in Tikrit when I thought, "You know what? I know everybody in the intel community, in the CIA and everyone says, "Saddam Hussein's not in Tikrit." But the behavior of these prisoners, the [00:12:30] behavior of the leaders running the insurgency indicated to me that there was a higher power in that area. They weren't acting the way they should unless there was a deep, deep power. Something scaring and forcing them to behave the way that they were. And my notion is it had to be Saddam. Kyle Davis: And how were these people acting? I mean once you've kind of peeled back the onion [00:13:00] so to speak and you're not kind of getting to the meat of the situation, and you're in communication with the prisoners that you're interrogating or really kind of talking with, I guess, you know at what point and what were you seeing that kind of made the hair on your back stand up? Eric Maddox: Great question. So what did it for me is I believe there was one individual, his name was Mohammed Ibrahim. He was a former inner circle body guard [00:13:30] of Saddam Hussein and he was a fun loving guy, right? I mean everybody liked him. He liked to drink whiskey and play Dominos and the guy didn't have an enemy in the world, good sense of humor, but he was a former body guard. Well when I would interrogate, let's say his nephew, and I would talk to his nephew about all of the nephew's uncles, one of which would be Mohammed Ibrahim, he would say, "Oh yeah, this uncle Bob, or uncle Willy," or whatever Arabic name they had, he says, " yeah I was him a [00:14:00] few days ago and I hang out with their kids." When I got to Mohammed Ibrahim, " So what about your uncle, Mohammed Ibrahim?" Eric Maddox: He says, "Yeah, I don't talk to them." I said, "Well what about his kids? How old were his kids?" And he had a kid-, Mohammed Ibrahim had a son that was the same age of this nephew and he goes, "I don't talk to my cousins." I said, "Why?" And he just kind of looks at me and just said, "Man you don't get it. You don't get it." And he was basically saying, "You don't understand the power [00:14:30] that this Mohammed Ibrahim holds. My uncle ..." And I'm like, "Wait a second, the fun loving, whiskey drinking Domino player? There's no way he's carrying that power by himself. It's not who he is, he's got to have the power of Saddam Hussein." It would be things like that, that I'm like, "What is going on out there? Don't tell me, don't tell me the brutal dictator is not somewhere near, because people are sure behaving as if he is." Kyle Davis: Mm-hmm (affirmative). [00:15:00] So I know that there's like an interesting kind of cat and mouse game that kind of happens during this point in time. If you can kind of, you know once that happens, once you're like "Okay, this Mohammed Ibrahim guy is nearby, which means we have to have Saddam." You know, what next? Eric Maddox: What next is you try to go after Mohammed Ibrahim. Eric Maddox: I mean you gotta, you go, you know " We got to go after Mohammed Ibrahim." So we'd built a link [00:15:30] diagram of all the insurgents individuals we knew and their commanders and commanders and it all came to the very top at Mohammed Ibrahim and it's two thousand names, okay? So what we had to do is say, "All right, we are not going to go after every single bad guy." Remember that's what we did before, Kyle, is we said, "Hey, we'll pluck all the weeds." Well if we're going to get down to the root system, we need this Mohammed Ibrahim. So what we did at that point was we said, "We're only [00:16:00] going after individuals we think can provide United States detailed information with regards to Mohammed Ibrahim." And the beginning of the month of December, that is all we did. And we did it every single night. We would do a raid after a brother, a business partner, a sub-commander. And at that point, A. I knew I was able to break prisoners pretty quick. I mean within [00:16:30] a couple hours I could get the prisoners to go, "Yep. You got me, I work for Mohammed Ibrahim and I'll help you. Matter fact I'm going to help you 'cause I know you're gonna help me Eric and I know that's the only way I'm going to get out of this situation that I'm in." So the prisoners were corroborating, we were dialed in on one guy, but to find the exact location of one guy is pretty tough. So our whole goal was, "Find this one guy and let's hope [00:17:00] I can get him to take us to Saddam." Kyle Davis: Now, I'm trying to remember, because I did recently watch the CNN thing, again. I'm forgetting what the order was, was it Mohammed Ibrahim or was it Saddam first that you caught? Eric Maddox: Oh, we caught Mohammed Ibrahim first. Kyle Davis: ... into that, into how that worked with Mohammed Ibrahim. Eric Maddox: Right. So, like I said, the big key for us is we found Mohammed Ibrahim's driver and some prisoners who said, "The driver knows everything." We found him on December 1st. And the driver comes to us and said, "Listen. You're not going after Mohammed Ibrahim, you're going after Saddam Hussein." He said, "I drive about millions and millions of dollars. Mohammed Ibrahim tells me where to go and who to deliver [00:18:00] the money to and the orders. And Mohammed Ibrahim's taken all the orders from the President, Saddam Hussein." So at that point, that is when we were like, "Oh, we were right. We are going after Saddam." And so we were going from person to person where it eventually pushed Mohammed Ibrahim out of Tikrit. He went to the town of Samarra. And we went to the sub-commander. His sub-commander's house is smart, he wasn't there. Then we found out that he had a rental house, Mohammed Ibrahim had a rental house. So we [00:18:30] went there and he was not there but his son was. And the son came in and said, "Hey my dad was here a couple hours ago. You just missed him." And we're thinking, I'm like, "I'm done. What am I going to do?" But the kid's telling me about what his dad likes to do and he likes to fish and so they fish right next, along a river, next to where they just built a pond. And I knew, I said, "You don't just build a pond in the middle of a war." But I also knew [00:19:00] that Saddam Hussein had a favorite food and it was a fish dish. And I interrogated his chef and the chef said, "Listen, this guy eats this fish dish every single day." And I knew we had to go to that fish pond. So it was actually my last, no, target while I was still in Tikrit was this fish pond. And my, you know, the Delta Force commander says, "Yep. All or nothin." We hit it. We raided it, and Mohammed Ibrahim was there. [00:19:30] And I almost thought we were dead, I thought we were done. So I'm leaving, take the fisherman to Baghdad and I'm leaving the country, and I had to wait a few days and I interrogated a fisherman and one of them finally broke and said, "Listen, Mohammed Ibrahim, I think he left and I think he went to Baghdad," Which is where we coincidentally were. He gave us the target and so, you know, that night, my last day in the country, they raided [00:20:00] the house in Baghdad. And they didn't think they caught him. They said, "Ah, we didn't get him. Too bad." I'm leaving the country and I'm flying out and they brought the prisoners that they did find from the house, they brought them in about three in the morning. My flight leaves at seven in the morning. And I thought, "You know, let's just see. Maybe we were close. Maybe we just made a little mistake. Why wasn't he there? Why wasn't Mohammed ..."
Well, [00:20:30] I began my interrogations and one of the prisoners kind of hinted that he was at the house. And that we had actually captured him. Mohammed Ibrahim we had, so with just a couple hours left in the country, I finally, finally got to talk to Mohammed Ibrahim, I was short on time and my very last minutes and said, "All right. I'll do it." And he said, "We gotta go now." And he gave the house, the location, guys name. And he [00:21:00] said, "We gotta go right now." So I gave the information to the people I, you know, the other interrogators there and said, " You gotta call Bam Bam," that was my Delta Force commander in Tikrit. I said, "Saddam Hussein's in Tikrit. This guy's gonna take us." And they were like, "Okay, good. There's your plane. You're out of here." And I left. They just didn't believe us. They didn't think Saddam Hussein was in Tikrit. And they did call [00:21:30] Bam Bam and he flew down and got Mohammed Ibrahim and took him up to Tikrit and that night they conducted the raid at the famous farm house. And Bam Bam and the Delta Force team couldn't find Saddam and eventually they got Mohammed Ibrahim out, the prisoner, and said, "Where is he?" And it was actually Mohammed Ibrahim who took him around the side of the house and pin pointed the hole. And they dug it up and sure enough, there was Saddam. Kyle Davis: And he's hidden, he's down there with that really bad [00:22:00] looking suit jacket and that scraggly beard and, "Hey." Kyle Davis: I'm just basing it off of the pictures that I saw. Eric Maddox: ... really shocked. He was really shocked. Gail Davis: Eric, how did you find out? Kyle Davis: ... how did you find out? I think that's like an interesting ... I mean cause you're, I'm assuming at this point in time, you're on a plane. Eric Maddox: So, you are and when you're with this task force you just don't come straight home, you got to do what's called an out briefing. And they fly to you Doha Cutter, and [00:22:30] you know, the next morning I'm going to my briefing and the guy driving me to the briefing said, "Hey, you know, they ... the team in Tikrit came down picked up your prisoner. And they were planning a raid last night." And I, at that point, I'm like, what? What happened? And the guy was like, "Oh it was getting late man, I went to bed." I'm like, "Oh gosh." You know, 'cause it's a raid in Tikrit, [00:23:00] who cares. And so I get there to my briefing, hoping. And they were like, " All briefings are canceled," and they just shut the door on me. And the kid, my driver, you know, my sergeant and said, "Hey this is the interrogator from Tikrit." And then they kind of, they're like, "Are you Eric Maddox?" They pulled me in, they said, "All briefings are canceled cause we got him. We got him last night." They said, "Hey, you know, we called Bam Bam, [00:23:30] told him that you had Mohammed Ibrahim and you thought, you know, you said Mohammed Ibrahim will take you to Saddam and Bam Bam didn't hesitate." They jumped on a helicopter, picked him up, and did the raid. Eric Maddox: ... game changer. Kyle Davis: ... that's a game changer indeed. Now, I think what's kind of interesting is that in some of the things that you talk about, I believe in your speeches, like [00:24:00] how intuition and following your gut can kind of like help you with that. I mean, would you say that, you know, is that kind of you know the base line as to where you're starting from? Or would you say that your intuition and listening to your gut came from having these, you know, conversations? 'Cause I think when most people think of interrogations, especially, you know in the global war on terror, kind of, context, they're thinking like you know some CIA extraordinary rendition, waterboarding type stuff. And that just simply wasn't the case [00:24:30] with you. So was it, was it the conversations or was it something else? Eric Maddox: Well it was, it was not my gut, okay? So I, when people say you have a gut feeling, I'm like that's ... that's indigestion man. There's no such thing. So, there's something to, I do believe in gut feelings, but there's something to it and, but for me, it was about listening at a level deeper than most people can imagine [00:25:00] is even possible. So for me, it was to hear the comments, the words, the stories coming out of my prisoners from a level of empathy that I truly understood what they were trying to say. And it's really challenging, right? So for me initially, I had to remove all these distractions. And you think about anybody who has a conversation, [00:25:30] " Oh the distractions that are going on in their mind." I mean, you know, it's bi-, one of the biggest distractions we have are biases towards the person that we're talking to. And you can imagine the interrogator[inaudible 00:25:40] to a prisoner. And then the goals and agenda that somebody has during a conversation is a huge distractor. And even things like what I'm doing to say next, right? Like how many times are you trying to speak and, but it prevents you from listening and hearing and so what [00:26:00] when I can remove those distractors, I actually can hear, you and I can listen to the same conversation, but I'm going to hear different things because I'm listening more intently, I remove the distractions. And then what I do, is I try to figure out, from where is this person coming. What are their fears? What is their agenda? What are their goals? What are their biases towards me? And that's how you acquire that empathy. And I've realized, what really [00:26:30] helped me out, is once I can do that, and I can connect with that prisoner, I can go from an individual who said, "I don't trust you. You're the bad guy, you guys came and raided my house and you captured me and I'm a prisoner," to, "You know what Eric? You get me. You understand me. And I know you're gonna help me." And it's this influence power over the prisoner. And that's the key. Ultimately, [00:27:00] I am nothing without my prisoners. The cooperation and them going, "No, no, no Eric. I'm telling you, Saddam Hussein's here and we got to go. As a matter of fact, when Bam Bam and the team can't find him, get me out of this damn truck, Eric, I'm a show exactly where he is." Gail Davis: That's so awesome. Eric Maddox: And you do that through empathy. Kyle Davis: Yeah. One of the things that you do special workshops on are the empathy based listening and teaching people how to get it. [00:28:00] Is that something that when you're talking about getting to the realness and at a deeper level of understanding, when you're running those extra curricular workshops, is it something of a level apprehension for people? That then, once they come into it, is it better? I don't know if that makes sense. Eric Maddox: You know, there's really no apprehension. They just don't know how to do it. And a lot of people think, "Well, you're either born with empathy [00:28:30] or you're not." I said, "No, no, no. It's a muscle. And we can get it in shape. And you need it, right?" I mean if you really think about wow, how important is listening? Well you think average humans, average person listens to 25% of what they hear. 25% is terrible, right? That's bad. Well, by simply removing distractors, you can move it up to 50%. And then the amount empathy that you employ will take you to 50 to 60 to the 80s and maybe into the [00:29:00] 90s. So think about what you get with that. What does that give you? If you start listening with empathy and removing distractions. First of all, you become the best intelligence collection officer out there, right? Who doesn't want that in business? I mean if you know the needs of your clients, and the needs of your subordinates, that's half the battle, is just knowing, having more accurate information in order to make better decisions. But, the fact [00:29:30] that you employ the empathy makes your clients and your customers and your subordinates go, "I with you. You get me, so I'm with you." So it's, you know, it's influence. Somebody gave me the definition of leadership, he said, "Influence." Leadership is influence. Well I'm telling you that there's no stronger, none, characteristic of influence than interacting with somebody with empathy. Kyle Davis: Mm-hmm [00:30:00] (affirmative). Now, in those steps, you mentioned, the first thing was just removing distractions and the next part was deploying empathy, if you will. Kyle Davis: From like a 30,000 foot view, how does someone remove the distractions in a conversation because, you know, it's 2017, I'm waiting for my watch to vibrate to see if I got like a text message or something like that and you know, my mom may be sitting on a computer reading, sending off an email, waiting for something else. So how are people removing distractions [00:30:30] to help, how would you deploy that for removing distractions? Eric Maddox: What I did is I created categories of distractors, right? There's seven categories of distractors. One is biases towards the person you're talking to. There's other ones So, and if wants my list of distractors and sort of my kind of write up on empathy based listening, they can just shoot me an email. My email's real simple it's just eric@ericmaddox.com. And I will [00:31:00] shoot, no, free of charge, you're not going to get any spam from me. But if you want that distractor list, categories ... but what you do is before you, you know what I challenge people to do is just to, "Hey, take a 30 day challenge. And take one conversation, not every one, pick one conversation, where before that conversation, I want you to look at my categories of distractors and I want you to fill it out. What could possibly be distracting you in these different categories. Go into that [00:31:30] conversation, have it, do your best, try to put those things aside, then come out and evaluate yourself. " Hey did these things get, was I thinking about these things?" Right? And that's simply removing distractors, that's not even pulling empathy based listening yet. I mean empathy, that's not, we first have to remove distractors before we can have empathy. Kyle Davis: Mm-hmm (affirmative). I think bias is an interesting one because you can sometimes you go into a conversation thinking, you know, oh this is automatically how the person is going to react so then you [00:32:00] dig in to a way of thinking and trying to react with them and you're, really what you're doing is your setting yourself up in concrete and not being fluid like water and you know really pulling that veil off so that way you don't have the bias that's making you come into the conversation in a certain way. Eric Maddox: I love talking to organizations and their sales forces, right? They're the ones that really need to [00:32:30] stop and listen and employ the empathy and remove the distractors and not, you know, and they're thinking about, "Here are the products that I can sell that can get me this quota. You know what, I think, I know this person well enough, this should fit just fine with them." But if you really listen to them ... you know think about wealth managers and to gain the trust of their clients, they really listen to them. Actually their clients will [00:33:00] step forward and say, "You can have it all. I want you to control every aspect of my retirement plan." Right? And if there's that hesitation and there's that timid, uh, I'm not certain, it's based on a lack of trust. And I'm telling you, wealth managers, will say, "But Eric, I'm at a high level of integrity." And I say, "Well that's the problem. You think trust is based on integrity. Integrity's just assumed. Trust is based on understanding. [00:33:30] If somebody feels that you understand them, that's how you gain their trust. And that's how you have the influence over another individual. It's through that understanding. Kyle Davis: It's kind of like, you know thinking a business has been around for a while, you know 20-30 years and go, " Well I have this reputation in Xe industry, just kind of sitting around and you know, I have this weight [00:34:00] behind me." Well that's great, but if that's what you think you have then you're resting on your laurels, if you're not, you know coming at it and really trying to go and pull at those heart strings with an empathetic client, or an empathetic focus towards your client. Eric Maddox: Right and you know there's power in that 30 years of trust and that brand. Sure, absolutely. But that'll get you so far. 'Cause at the end of the stay, they're gonna sit down across from got to be another [00:34:30] human being. Eric Maddox: And they've got to be able to trust them. Gail Davis: I think it's been really interesting to watch how many of your experiences are translatable to businesses. So people love to bring you in to hear the story but then, you know, they have, there's so much take away for them about the listening. And I also like, you know, that, I mean in a way you were trained [00:35:00] to do the interrogation by a certain method but you knew that wasn't going to be effective. So trusting your gut, well maybe that was a trust your gut, sorry I know you'd said, but you know, you knew another approach would work. And that's kind of dicey to bring in a speaker that talks that way. But it's really true, I mean you got to assess your skills and what you've been told to do and you've got to mirror that up for the most obvious win-win. Eric Maddox: Yeah well, I mean first [00:35:30] when you say, you know people bring me in to hear the story but there's takeaway, I'm very proud and happy now that when I give a talk, afterwords if I talk to 20 people, 18 of them are going to want to talk about this empathy based listening. Two of them are going to want to continue to talk about Saddam and I got it. I found Saddam and I am proud of it, I love it, it's a fun story. But at the end of the day, we want to bring people to action, right? Eric Maddox: I don't want the audience to go, wait, [00:36:00] wait, wait, wait, wait, I'm at 25%, I want to influence, I want to be a great information gatherer so I can make better decisions. But more importantly, I want to have influence over people. And this is the number one way to do it. Who wouldn't want that? Kyle Davis: Yeah one of the things that you also talk about, aside from you know the empathy base listening but really can provide you influence, but um, is also elicitation techniques and helping people kind of elicit [00:36:30] or get people to elicit information that maybe they wouldn't normally give up. Could you shed a little bit of light on that? Eric Maddox: Sure. It's just interesting because we all hire people, we promote. A lot of mergers and acquisitions and we're bringing in new people all the time, and we have interviews, and there are things we want to find out, we need to know what kind of performer is this, what's going on in their world? And everyone has that, those goals, but when [00:37:00] I help people with these interviewing skills, where I'm simply trying to help them gain transparency. There's just not a plan. And I realize there's not a plan because they really don't know how to think about the questions they ask and how they ask them. And I've got about 9 different questions interview techniques. And you wouldn't use one individually, but they're all just sort of little tricks, you know kind [00:37:30] of a tool you keep in the tool bag. And when you put them all together, you could be a pretty amazing interviewer. You can have conversations with somebody that on the surface, looks like a standard conversation. But they have a plan, they have a strategy, they have goals in mind. And you will gain transparency. And when I train a group and they have that power, they just absolutely love it. I mean they just like, "Thank ... I knew there was something." [00:38:00] And some people that are really even good at it, they're like, "Yeah, you know I use about six of those. And I'm, I didn't know it. But, here's the things that I go at. Or some other people will be like, "And now I see why I'm pretty terrible at this." And it doesn't matter what level you are, it's just understanding the tone, the pace the type of questions. And even, really important, the responses that you give. And I just love it. I just [00:38:30] think it's so fun to talk about, think about. You could practice it every day, at least, as long as you have an interaction with somebody. And yeah that's the elicit training I provide. Kyle Davis: I like to call it mental jiu-jitsu. Eric Maddox: That's it. Right? It's jiu-jitsu is so critically important in all interviews. Especially ones where there's maybe not complete transparency. They do a job interview? Right? That's, so jiu-jitsu is my one of my nine question techniques. Kyle Davis: [00:39:00] Is it really? Kyle Davis: Mental jiu-jitsu for the win. Eric Maddox: No, I thought you pulled that off my website. Kyle Davis: No, no, no I'm being serious, I had no idea what the nine were. Eric Maddox: You know what order we captured Mohammed Ibrahim or Saddam, that's all right. But you guessed [crosstalk 00:39:16] and know jiu-jitsu, that's[inaudible 00:39:18]. Kyle Davis: I ... for those who don't know, here's a little background on me. I delved into the counter terrorism world when I was in school and did a lot cool projects, which Eric [00:39:30] and I have talked about before. We have some friends together. But yeah, no, I've heard so many of these really kind of cool stories that just like, they all kind of blend together. So I'm like Mohammed Ibrahim ... I mean I know ultimately you got Saddam but like, and I'm not being quizzed on it and I'm not reading those books anymore or reading any like special newspaper type stuff. So, yeah. Gail Davis: That's awesome. Well it has been so cool rehear the story, I never get tired of it, I just love it. Kyle Davis: And if you really want to learn the story, by the book. Gail Davis: That's right, Mission [00:40:00] Blacklist. Gail Davis: That's the book. Or, call GDA speakers to bok Eric. We love that 214-420-1999 or gdaspeakers.com. Kyle Davis: ... Saddam. Aside from that, you also, [00:40:30] like we hinted on here too, you also do special workshops on empathy based listening and Eric also does stuff on elicitation techniques. There we go. Kyle Davis: My moth doesn't want to work this afternoon, either. Thanks Eric. Gail Davis: Yeah perfect. Thank you Eric. Kyle Davis: Have a good one. ep. 30 - Eric Maddox: The Interrogator Behind Saddam Hussein's Capture by GDA Podcast is licensed under a Creative Commons Attribution 4.0 International License.